Following a meeting of the Queen’s Park committee on 8th February 1873, their secretary Mr. Archibald Rae wrote to the Scottish clubs proposing a Scotch Cup for competition among Scotch clubs the following season. 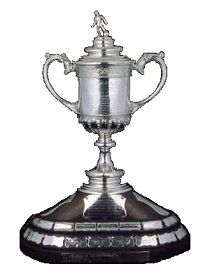 The Association Challenge Cup trophy and eleven badges were purchased in 1874 for the sum of 56 pounds 12s 11d. The trophy was made by Messrs. George Edward & Sons with the design of ornamentation taken from a sketch by William Ralston. This depicted one of the Scottish players dribbling during their first official international match against England at Hamilton Crescent on the 30th November 1872. The above is an extract from the Scottish F.A. Challenge Cup book: The Beautiful Dribbling Game. A special thanks to Steve Bartrick (Ancestry Images) for permission to use his scanned image of Pictorial World’s “Football Match at Dumbarton: Dumbarton v Queen’s Park” engraving as the basis of my header etc., and to British Pathé and William Hill for permission to embed their archive footage and match highlights in the results pages.